Clement Wragge was an observant visitor to Rarotonga in 1904. He reported that Paper Hornets (Rango Pātia), Coconut Stick-insects (‘Ē) and caterpillars were very common pests. He was told by his round-island guide that Resident Commissioner Gudgeon would not introduce the insect-eating Common Myna for fear that it might destroy fruit. The guide also said, "If insect-eating birds are not soon introduced, the pests will ruin us." At that time there were no insect-eating native birds common on the lowland and, obviously, the few Australian Magpies and Skylarks introduced from New Zealand in 1892 by the British Resident Frederick Moss, had not survived. By 1904, the Common Myna, a native of India and western Southeast Asia, had been introduced to Australia, New Zealand, New Caledonia, Fiji and Tahiti to control various insect pests. Wragge had seen it in New Caledonia and in Tahiti. In March 1906, Sidney Davis, the manager of Cook Islands Trading Company, wrote to his trading partner in Tahiti, Mr. H. Meuel, to obtain some “Indian Minahs”. Mr Meuel replied that he knew of them as Merle des Moluques and could obtain them at about 4 shillings a pair, noting that they were “imported [to Tahiti] to help in the destruction of wasps, but it is found in practice that they also feed with preference on native fruit, such as Bananas, they multiply pretty fast.....”. Merle des Moluques, literally “thrush of the Moluccas”, refers to the Molucca or Spice Islands in Indonesia. Although common in Tahiti they proved more difficult to catch than expected, and first colony of about 20 pairs was eventually shipped on the 22 June. Davis released most or all of the birds on his farm in Tītīkāveka, and this event was reflected in the early Tītīkāveka name for the myna: Manu Tēve (Davis’ Bird). Within a few weeks, on 12 July, Commissioner Gudgeon issued a proclamation to protect the imported birds, stating that they were expected to benefit the island by eating insects. Although there is no known record of the Commissioner initiating or approving the introduction of the mynas, the Proclamation demonstrates his support, even if only after they had arrived. More colonies were imported in 1907 and 1909. The official import records for show birds from Tahiti in 1906 (£6), 1907 (£10) and 1909 (£8), and not on any other years. 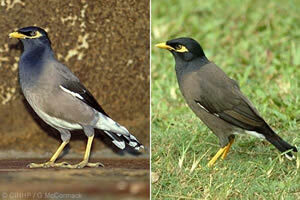 The early Matavera name for the myna was Manu Pīrū, in memory of a few birds introduced by Jean Peyroux. One tradition has him releasing them at his property in Matavera, while another has them flying ashore from the ship when he returned from Tahiti. If he did introduce them before the Davis birds it must have been after the August 1904 visit of Wragge, and they failed to be officially recorded as an import, and they also failed to attract any comment from the Commissioner. All this circumstantial evidence indicates that Piru probably imported his few myna birds after the 1906 importation by Davis. 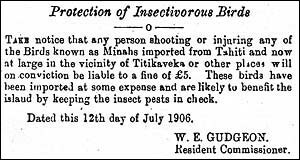 In January 1914, Agriculture Officer Reid reported that the mynas were not numerous enough to control the insect pests, but that they were useful in attacking the Coconut Stick-insects (‘Ē). Although several records throughout the 1800s note that the Coconut Stick-insect was exceedingly common and very destructive there is no known record that specifically states that the myna was introduced to control this insect on Rarotonga. By the turn of the century the Paper Hornet was also a major pest in the cotton plots and the biologist Whitley recorded in 1933 that the myna had been introduced to “cope with the large introduced wasps”. In those days people placed great hope on the myna bird as it was introduced to New Caledonia to control “locusts”, Tahiti to control “big wasps and cattle ticks”, and Fiji to control locust-related insects. The general evidence from Rarotonga indicated that people hoped it would control a number of insect pests, especially the Coconut Stick-insect and the Paper Hornet. The modern name for the myna, Manu Kavamani reflects the way the people saw the role of Government in protecting Davis’ birds, or the later role of the Government in introducing mynas to the Outer Islands. The Coconut Stick-insect was accidently introduced to the Cook Islands on the ancient voyaging canoes. It is ‘Ē on Rarotonga, and ‘Ē‘ ē on most of the Outer Islands. The female often exceeds 10cm in length and is camouflaged green. 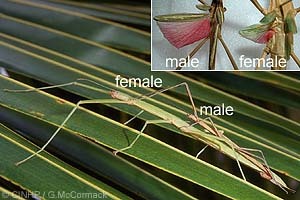 The much smaller male is easily mistaken for a brown twig. They feed almost exclusively on Coconut Palm leaves, and live in the crown, hiding on the underside of leaves during the day. Last century, several writers noted the extreme abundance of the stick-insect on Rarotonga. For example, Rev. William Wyatt Gill wrote in 1885: "I have seen immense groves of cocoa-nut palms destroyed in a few months by this species...."
In April 1915, the Resident Agent on Ma‘uke, Brian Morris, wrote to the Commissioner in Rarotonga for assistance: "A large number of cocoanut trees have been much injured by the [Coconut Stick-insect]. I believe they are increasing in number and as there is no insectivorous birds here I should suggest that a number of birds from Rarotonga called ‘miners’ (as well as I can recollect) may be trapped and sent here as soon as possible." Commissioner Northcroft, because the Common Myna was not yet common on Rarotonga, arranged for the British Consul in Tahiti to send colonies direct to the Outer Islands on the steamer. The September steamer with the first colony called at Mangaia instead of Ma‘uke, so that’s where the first mynas for the Outer Islands were off-loaded. The dutiful note from Resident Agent Cameron records his thanks and surprise - as he had not requested any birds. The condition of the birds upon arrival was: 13 healthy, 4 sickly and 6 dead. During October 1915, a colony was released on ‘Ātiu, where they were called Manu Rātaro, after Resident Agent Russell. During November 1916, colonies were released on Aitutaki and Ma‘uke. Unlike the other islands, the Ma‘uke colony was actually from Rarotonga, with a note from Commissioner Platts: "I trust they will be as useful in the suppression of insect pests at Ma‘uke as they have proved at Rarotonga." The colony on Mangaia failed to establish, and during the 40s and 50s the stick-insect was causing serious damage. In the Auckland Star (8 Dec. 1958), the Minister of Island Territories, Mr Mathison, explained that the uneconomic level of coconut production on Mangaia was because the "Islanders had refused to import the mynah bird, which would have controlled the [stick-insect]." Ta Vainerere recalled that while on a private visit to Mangaia in 1958 he released about 200 mynas, which he had been given by Agriculture staff on Rarotonga. The late Ma'aki Metuangaro recalled trapping and caging mynas on Rarotonga for Mangaia: the 150 birds in the 1958 shipment died of exposure on the ship, while the 200 birds of the 1959 shipment survived. Despite the absence of written records, and noting that those involved were looking back more than 30 years, we can conclude that mynas were successfully reintroduced to Mangaia in 1958 or 1959. Today, the stick-insect plagues of the past are forgotten. The attention of the people is now on the myna plague. The Myna or Ruin in Early Rarotonga: First published in the Cook Island News, 18 September 1993. Mynas for Stick-insects in the Outer Islands: First published in the Cook Island News, 2 October 1993. Mangaia section updated in Nov. 2006. Based on historical documents, including copies of early CITC correspondence provided by Neil McKegg. Ma'aki Metuangaro was interviewed in the 1984; Ta Vainerere was interviewed in the late 1980s and in 2006. McCormack, Gerald (2005) The Myna or Ruin in Early Rarotonga. Cook Islands Natural Heritage Trust, Rarotonga. Online at http://cookislands.bishopmuseum.org.